"World class radio-orienteers shouldn't have to sleep in unheated garages!" That was the good-natured complaint of Jay Hennigan WB6RDV at breakfast on the first competition day of the 2007 USA Amateur Radio Direction Finding (ARDF) championships. He was recovering from a night in a rustic cabin near the shore of Lake Tahoe in the Sierra Mountains of east central California. The temperature had dipped into the 30's overnight, but was heading for the 70's under clear skies. Jay went on to win a gold medal in the category for men aged 50 to 59. To do that, he had to navigate with map and compass through the forest from the start line to the finish while finding all required transmitters (four in his category) in the least elapsed time. A typical course is five to eight kilometers long, if you travel the shortest possible route. Vadim Afonkin of Boston, the day's fastest, did it in an hour and two minutes. Others took up to three hours, which was the time limit for this hunt. The championships got under way on Friday with practice and equipment testing sessions, followed by a meeting for orientation and rules review. The two-meter competition took place on Saturday, then everyone gathered in the dining hall for a banquet in the evening. On Sunday, there was a similar competition on the 80-meter band in a different part of the forest, followed immediately by the final awards ceremony, timed to end in mid-afternoon to accommodate those who had to hurry home. Both courses were set by Bob Cooley KF6VSE of Pleasanton, California (pictured at left). 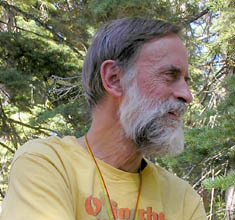 A long-time medal-winning orienteer, Bob used the experience that he gained in 2003 when he mapped this area and helped set courses for the national championships of the US Orienteering Federation. General Chair of this year's championships was Marvin Johnston KE6HTS of the Santa Barbara Amateur Radio Club (pictured at right). He is one of North America's ARDF pioneers. 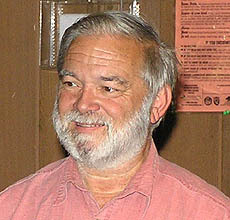 A member of USA's first team to the ARDF World Championships (Hungary, 1998), he has traveled to the WC's ever since as a competitor or juror. He won medals in competition at the USA ARDF Championships in 2002, 2003 and 2005. These Seventh USA ARDF Championships were combined with the Fourth ARDF Championships for International Amateur Radio Union (IARU) Region 2 (North and South America). Unfortunately, USA was the only Region 2 country represented. The foreign visitors came from Germany in Region 1 and Australia in Region 3. For the second year, Nick Roethe DF1FO and his wife Brigitte included the USA Championships in their auto touring of the USA. SBARC looked forward to even more foreign visitor participation, including two hams from Mongolia and five from Ukraine, but it was not to be. Their entry visas to the USA were denied. The denials came two weeks before the Championships, which was too late for the appeal process. One competitor who had no trouble gaining entry to the USA was Bryan Ackerly VK3YNG. He has been coming to ARDF events on our continent since the first IARU Region 2 Championships in 1999 near Portland, Oregon. Over the years, he has shed pounds and gained speed to become a world-class performer. His time in the 80-meter event was the best overall at the championships. Afterwards, he had enough stamina to run back onto the course for another hour, just to take photos of the other competitors. On arrival, two days before the two-meter hunt, Bryan got over his jet lag by hiking ten miles round trip from Camp Concord to the top of Mount Tallac, 9735 feet above sea level. Since there was no food at the camp when he got back, he went for another ten-mile run into town and back again. SBARC teamed up with the Los Angeles Orienteering Club to organize the events and to set up electronic scoring. Maps were provided by Bay Area Orienteering Club. This is the second time that SBARC and LAOC have organized the USA ARDF Championships under the direction of KE6HTS. In 2004, the event was headquartered in Gorman, California, at the top of Tejon Pass, halfway between Burbank and Bakersfield. To bring and keep radio-orienteers together as much as possible, KE6HTS and KF6VSE chose Camp Concord in the El Dorado National Forest for the event headquarters. This 29-acre facility near Mount Tallac is owned and operated by the Community and Recreation Services Department of Concord, California, which is 25 miles northeast of downtown San Francisco and a 170-mile drive from the camp. The camp is just west of the town of South Lake Tahoe, which is 35 miles from Carson City, Nevada, 64 miles from Reno, Nevada and 117 miles from Sacramento, California. Most of the competitors ate and slept there, to maximize their opportunities to interact with and learn from fellow ARDF enthusiasts. To provide even more learning opportunities, Bob Cooley led an ARDF training camp nearby on September 12 and 13. Camp Concord, which is celebrating its 40th year, hosts over 600 children every summer in six one-week sessions that include swimming, archery, sailing, horseback riding and leadership exercises. A separate foundation provides funding for families who could otherwise not afford to send their kids there. Even the counselors do not know which kids are on such scholarships and which are not. At the same time in the other half of the facility, family camp is taking place. As I talked with Camp Director Marylou Chopelas about her fine programs, I imagined how wonderful it would be if Amateur Radio operating and hidden transmitter hunting were included in the regular summertime camp activities for youth and families. Perhaps the hams of El Dorado County could make that happen. Click here to see dozens of photos from these championships. Portions of this report have been excerpted from my Homing In column in the Fall 2007 issue of CQ-VHF Magazine. Report and photos copyright © 2007 Joseph D. Moell. All rights reserved.